Caption for Sister : Having sisters to share this life with is something incredible that someone couldn’t imagine who doesn’t have. One’s sister is the most precious, loving, caring and important person in his/her life. She is someone who’s got your back always, who’s on your side in every situation, who understands you like no one else does and she is the one who will fight for you till the end. That’s the unique chemistry of sisterhood. How much do you love your sister? 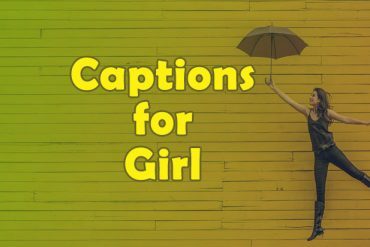 Here are some captions for sisters to post on Instagram or Facebook manifesting the unconditional love, boundless care and strongest bond with your sister. One’s sister is part of one’s essential self, an eternal presence of ones’ heart, soul and memory. There’s nobody in the world that knows me better than my sister. I love you, sister. Sisters love is something that can’t be described in words. Some people love her/his sister more than life itself. 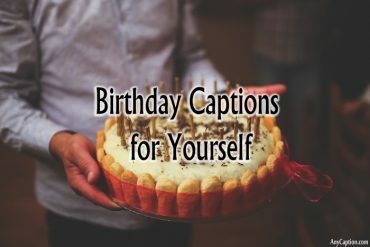 If you are one of them than say I love my sister with these captions for sister from this list. Probably you have a relationship with your sister as fun and as close too. 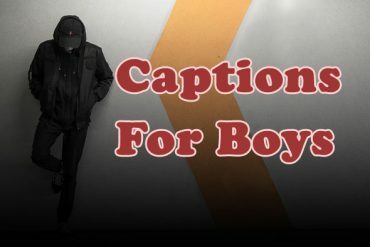 Post these funny captions for sister during those times when you desire to make fun instead of being annoyed at your sister. Being sisters means you always have the backup. 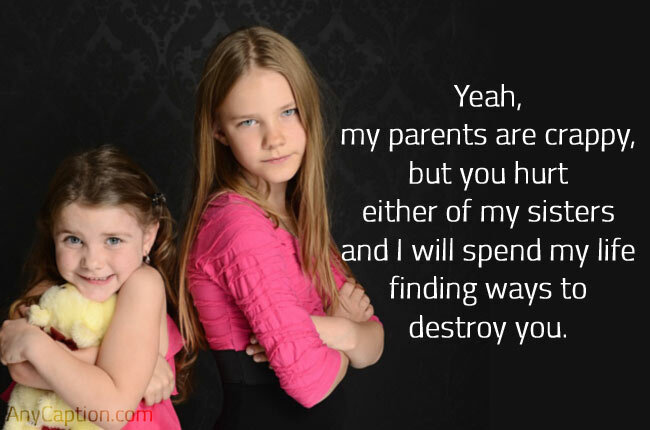 Sisters never quite forgive each other for what happened when they were 5. She is your witness, who sees you at your worst and best, and loves you anyway. She is your partner in crime, your midnight companion, someone who knows when you are smiling, even in the dark. She is your teacher, your defense attorney, your personal press agent, even your shrink. Some days, she’s the reason you wish you were an only child. Ah, her birthday! The best day to celebrate her with lots of wishes, cake, candles and of course plenty of snaps. 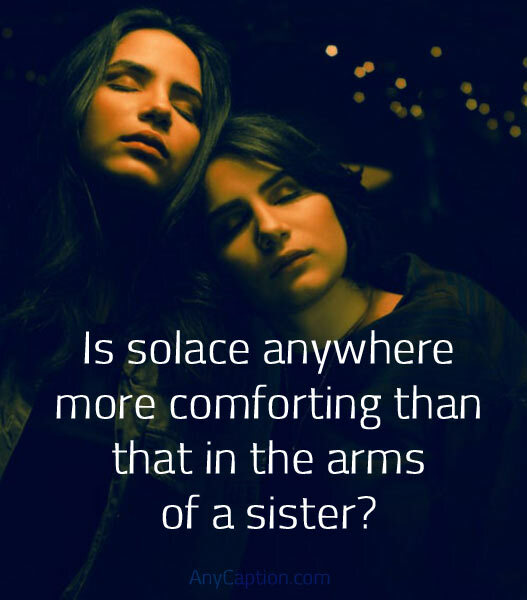 And to mark and celebrate this extraordinary day here are some of the very best quotes about sisters to post on Instagram or Facebook with your selfies together. Do remember the story mom used to tell that she found you crying on a street and then she took you home? The story was true! Happy birthday! 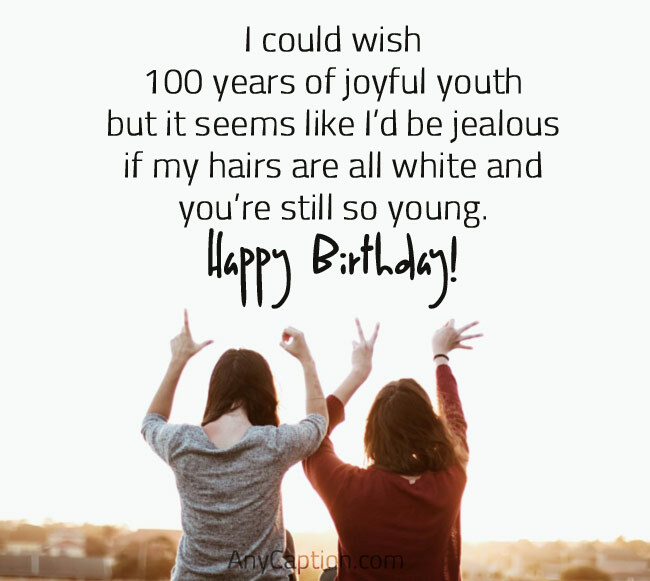 I could wish 100 years of joyful youth but it seems like I’d be jealous if my hairs are all white and you’re still so young. Happy birthday! 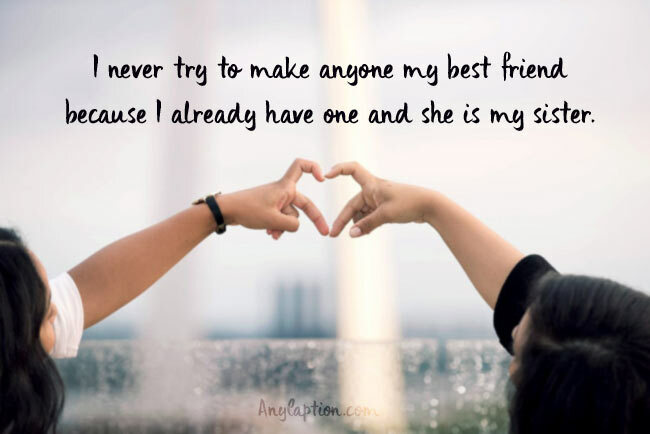 To my sister: You are my best friend, my human diary, and my other half. You mean the world to me and I love you. Sister, you are like my angel, with a love that always glows. You are one of the greatest gifts my heart will ever know. Your sister’s wedding day brings you the opportunity to take plenty of selfies and group photos with her and your family. As well as you get the chance to flood your Instagram and Facebook timeline with those pictures. 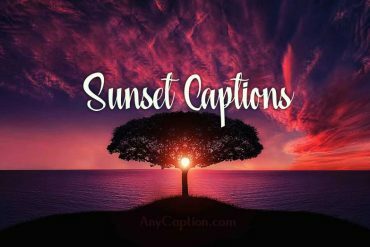 You may try these captions for sister’s wedding with all the pictures of this wedding celebration. I really wish he doesn’t yet know how pathetically talkative you are. I really feel so bad for the guy. Anyway, have a blessed married life! Thank you for always being you. Take some time to step back, and enjoy your big day. Love you forever. Hard moments might come, but remember – if the love is true, it will always win! Love you to the moon and back! Happy Wedding! I hope you’ll not be fighting with him as you do with me. Because he might regret marrying you. My best wishes are always with you. My sweet little princess has finally found her prince charming. You’ve enchanted us all with your smile my darling sister. I wish your fondest dreams would come true. Don’t ever shout at your husband. This guy seems so humble that he might have a heart attack. 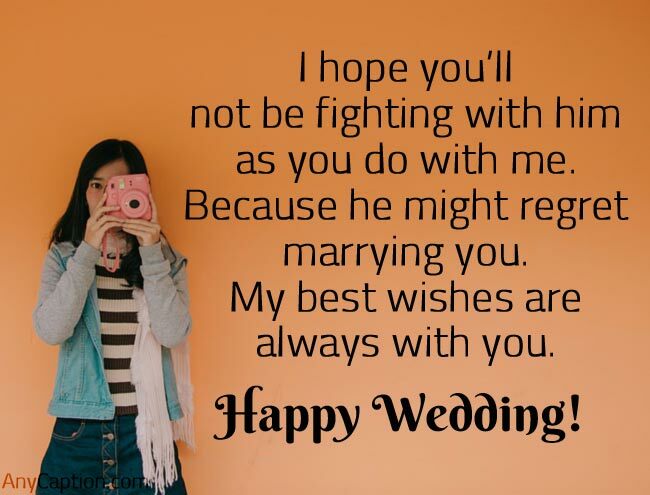 Hold your temper & have a blissful marriage! Sisters deserve celebration every now and then. Whatever it is national siblings day, women’s day, her birthday, wedding day or any other random day. 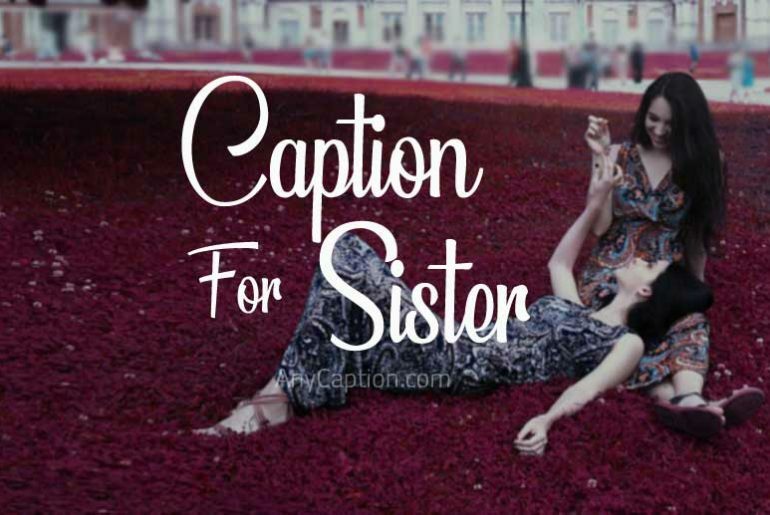 Obviously, those important moments you capture with your sisters need the perfect captions. 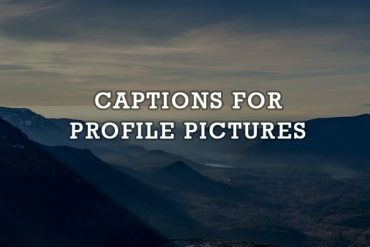 That’s what this above-listed caption is for.